While I was updating my website with the previous day's visit to Black Mtn, I noticed there was an officially unnamed summit I hadn't visited only two miles to the southwest. 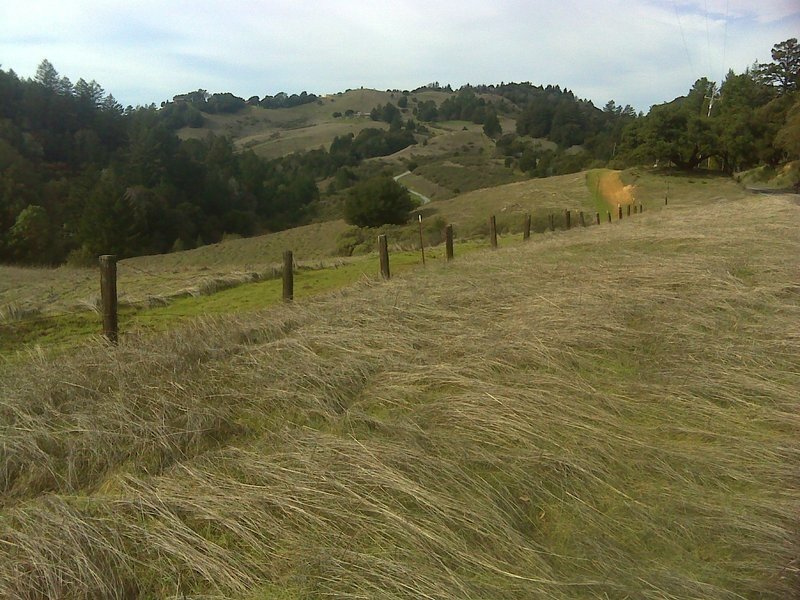 Located less than half a mile off Skyline Blvd (SR35) in San Mateo County, it forms the highpoint of Castanea Ridge. Public/private boundaries wander all over the map around this area, with a number of Open Space Preserves vying with private inholdings along the highway. Peakbagger.com showed several members had visited the highpoint so I didn't expect any issues. It would make for an outing similar to the previous day's, a few more miles of biking but less hiking. Rain was scheduled to start again on Friday, so Thursday was going to be my last dry day this week to give it a try. I took a more direct route to Saratoga than I had the previous day, forgoing the more scenic ride along the Los Gatos Creek Trail for the more urban experience of Saratoga Ave. From downtown Saratoga I rode seven miles up SR9 to reach Skyline Blvd on the crest of the Santa Cruz Mtns. Though the elevation gain was more than the previous day's ride up Monte Bello, the gradient was less severe and made for an easier ride. I then rode north about 4mi along Skyline to reach the junction with the gated Castanea Ridge Rd where I parked the bike. About half a dozen homes are located on the other side of the gate, the owners being the only folks besides OSP and emergency personnel to have driving privileges. An OSP trail crosses Castanea Ridge Rd right before the gate, connecting Skyline Ridge OSP with Long Ridge OSP. There are no No Trespassing signs at the gate or immediately inside and it appears most of Castanea Ridge Rd is part of the OSP property. An easy walkaround can be found to the left of the automated gate, making it unnecessary to hop any fences. So far so good. I walked 1/3mi up the road past a trio of homes, eventually finding a No Trespassing sign at the OSP boundary. If one is inclined not to violate the private property part of this road, backtrack a short distance and look for an opening leading up to the north above the road. A short grassy stroll will then lead you to the spot elevation Pt. 2,541ft. There is a stake in the grass marking the point. Feel free to call it good at this point and return the way you came. This is the point that PB and LoJ both identify as the highpoint. For the more rigorous among you, you will note that this is NOT the actual highpoint. Looking west you can see higher ground immediately towards a barbed-wire fence. Stroll over to the fence and you will see yet higher ground on the lawn in front of a green house. You're going to have to trespass to reach it, and once you do, you may notice even higher ground further to the west. The true highpoint is tucked under a large oak growing at the property boundary between the green house and the one immediately to the west. There is really no way to hide here. You kinda have to take your chances, hoping that no one is home. Your reward is pretty much no views, a bit of poison oak with and much nervousness. This is only for the most die-hard of highpointers who absolutely must get to the highpoint. Better views are had back at the grassy spot elevation inside the OSP.